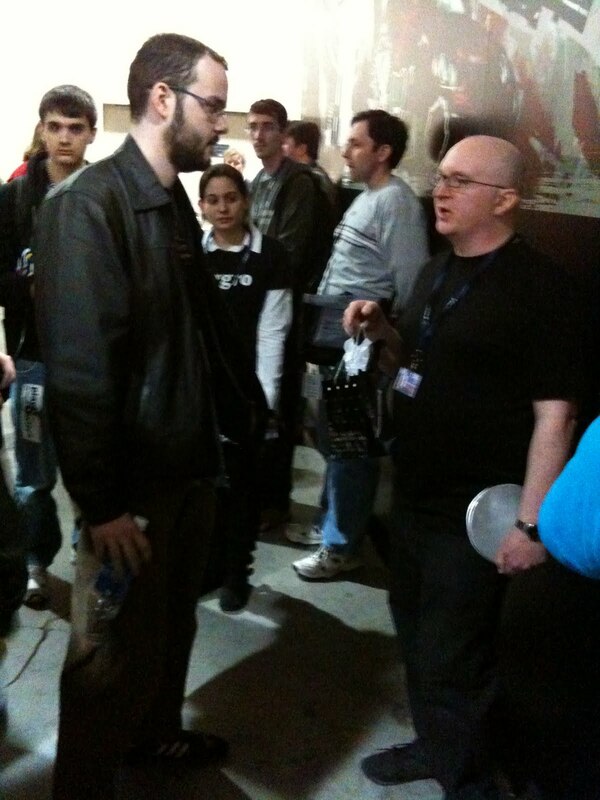 Above: Onlookers gather as an unidentified fan chats with a famed internet author (left). During the Q&A sessions between audience members and the tandem of Gabe and Tycho, you never knew what might happen. Most people couldn't help gushing a little, either about the comic or about the convention or about Wil Wheaton. Lots of people made jokes. Some asked for life advice. Some simply wanted to express their happiness. "These are my people!" bellowed a questioner at one panel. But for me -- and, I suspect, for many others -- the high point came during the last PA panel, on the closing day of PAX. A girl stood at the microphone and confessed that she wasn't sure she'd be able to say what she had planned to say without crying. She told a story about being in the hospital as a teenager, spending most of her waking hours in agonizing pain, and not knowing if she'd survive her illness. The best part of her day, she said, was when the nurse wheeled in a cart with a TV, an N64, and a broken PlayStation. Gaming provided the only real relief during the endless surgeries, not just for her but for her constantly worried parents. It was a chance to get her mind off things, and to play like a normal kid. Listening to this story, I was blinking back tears, and I wasn't the only one. When she finished, Gabe climbed down from the stage to give her a big hug. I've since heard that a scene like this happens at nearly every PAX, but that didn't make this one any less genuine or moving. This spirit suffused PAX. At another point during the panel, Tycho attempted to give a prize, some fancy-pants Intel processor, to an attendee. After the fan took it, he gestured for the microphone and said he'd like to donate the processor to Child's Play. Somewhat abashed, Tycho took it back. Any tribal gathering probably sends people away with positive vibes. I wouldn't be surprised if Tea Partiers get home from a protest, set down their "OBAMA BIN LYIN'" signs, and say to their spouses, "Y'know, that was just a nice group of people out there today. I feel so good right now." What the hell, I'm going to say it anyway: attending PAX made me feel great about gamers. My god, they were polite. I've never heard so many people in a crowd say "excuse me." Are these the same people who cuss me out on Xbox Live? It all comes from the top. I ran into Tycho on the expo floor, walking along a row of booths with a smile on his face, and I had to say hello. That was all I intended to say. He wound up pulling me to the side to talk about Heavy Rain, and some of the things I'd written about it. Several other people started massing around us, and I began to feel guilty for monopolizing his time. But it was the most normal thing in the world -- just two guys talking games. Blogging sometimes seems to take the form of a conversation, and some of my favorite things to write are responses to other posts. Even so, at the end of the day writing is a solitary pursuit. Writing, and playing, are things I do with my head down and the world closed off. This works most of the time. Writing may be its own kind of dialogue, but it's no substitute for the real thing. When PAX East has faded a bit, I imagine the memories that remain won't be of the playable version of Splinter Cell Conviction on the expo floor, or listening to the Video Game Orchestra smoke a rendition of the Final Fantasy VII battle theme. I think it'll be the human moments. Getting beers with several incredibly smart writers. Using Twitter to figure out who else is standing in line with you. Making eye contact with someone and thinking, "Aren't you...?" and seeing the nod that says, "I am." Hello Mitch! Gus Mastrapa gave me your name after the "Everything You Always Wanted to Know..." panel. Glad to find your blog! I was in line at the second Q&A on Sunday, hoping to follow up on my question from Friday where I had to shout my question into the theater because the mic temporarily died, and was frustrated that I wasn't going to get the chance due to the line behind the microphone being so long. When that girl told her story, I stopped caring. I spent time in the hospital as a kid, too, so I felt for her. I wish that story had made it into the Boston media. It seems like Boston coverage of games is sparse, but PAX East is a game-changer in terms of Boston's place in the games industry, and I think the media around here really needs to wake up to gaming and what it means culturally in America nowadays. That was you! "Epic" is right. So many great moments during those panels. I agree that it would have been nice to see that kind of thing reported elsewhere, but it surely will make the news when this year's Child's Play fundraising drive breaks records all over again. I feel like listening to that girl gave me a personal reason to donate.